Huh. Actually I hadn't thought of that. I'd been considering the mitred-square thing, but the last one took two years and I finally said "aughhhh" and knit a few inches of border and called it done. And it was only a baby blanket. Strips, now. 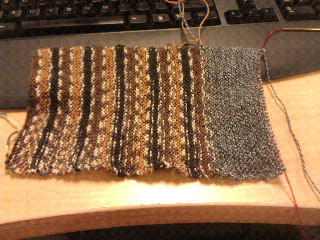 Withough two ends per teensy-weensy square. That I might be able to do something with... Nice idea, thanks! Nice. Tola knits Monster Socks ('cos they're supposedly as neat, tidy, and pretty as monsters should be), or knubbelchen (little knobbly people with hats) from them. Personally, I'm in favour of the Monsters, 'cos they're usually for me. like Mike says, i make Monstersocks, and Knubbelchen, and Hexipuffs. i cannot bear to throw away a yard of sock yard. I started my hexipuffs back in January. I have a little wooden box near my knitting chair with a sachet of lavener in it that I throw them into when they're done. Those are addictive. You are a brave woman knitting a sock-leftovers blanket. I either knit fingerless mitts with the leftovers from socks or I knit another pair of sock legs (if the yarn is patterned) and then use cream for the feet.